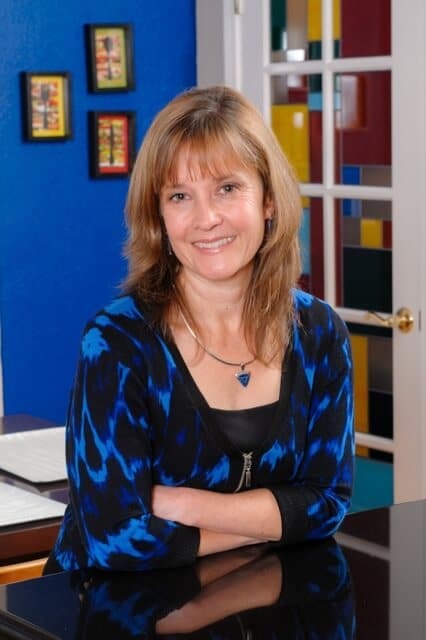 TV – Anna Jacoby Interiors Paste your Google Webmaster Tools verification code here Cool colors recede, making them good choices for small rooms. Try icy blues and soft, pale greens. These restful colors are particularly good in bedrooms. Neutral tones like gray and taupe also work well in small rooms. Keep ceilings and trim work painted white or in a lighter version of the wall color. 2. For flooring, use one type only, such as wall-to-wall carpeting or hardwood floors. If you must use an area rug, use one larger one instead of several smaller ones, and stick with a lighter, solid color or a subtle tone-on-tone pattern. 3. Use a monochromatic color scheme for the room. 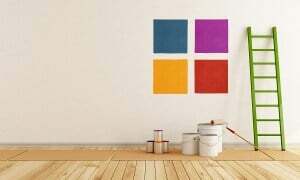 Select one main color and run with it, using varying shades of the hue for walls, flooring and furnishings. Use tone-on-tone patterns in upholstery fabrics, but be sure to incorporate a mixture of textures to add interest to the space. For example, choose golden chenille for the sofa, creamy yellow for the walls and light oak wood flooring. Choosing upholstered pieces, such as sofas and chairs, in colors similar to the wall color will allow them to blend in and make the room seem more spacious. Avoid vibrant and busy fabric patterns. 4. Be careful when selecting furniture pieces. Using fewer, larger scale pieces can actually make a room seem larger than using many smaller pieces. For example, instead of a separate TV stand, stereo cabinet and DVD storage unit, house the TV and all of the related components and accessories in one media cabinet. Also, keep in mind that some furniture pieces take up less visual space than others. Armless chairs, glass top tables and low benches are some examples. 5. Minimize clutter. Too many tiny knick-knacks can make a room feel much smaller than it is. Instead opt for a minimalist look with fewer, larger accessories. On the mantel, for example, replace any small, skinny candles with one or two large-scale candlesticks. And over the sofa, use one large painting instead of a collage of smaller pictures. 6. Lighten up the window treatments. 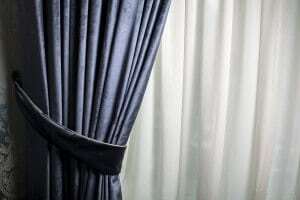 Replace dark, heavy draperies with filmy, gauzy fabrics that let in natural light. Select a neutral white or ivory, or a fabric color that blends with the wall color, and avoid busy patterns. 7. Add lighting. Dark rooms can seem smaller than they actually are. The best way to remedy this situation is to add lighting. I don’t mean to say bring in lots of table lamps. Doing this will simply add clutter, and will not adequately light your space. Splurge a little and have an electrician add recessed lighting, a large center ceiling fixture, track lights or wall sconces. Money invested on lighting is always money well-spent. With some careful planning and a few changes, your small rooms can look and feel more spacious. 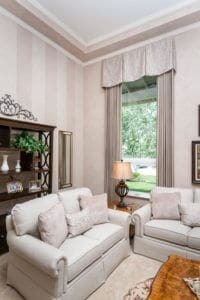 Are your window coverings in need of an update? Perhaps you notice a cold air entering or warm air escaping through your windows; perhaps your needs have changed and you would like to have a dark room in the morning so you can sleep in. 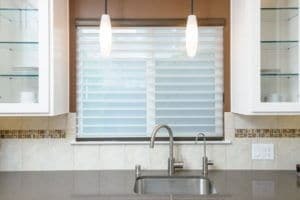 Perhaps your current window treatments look outdated or worn out, or privacy is an issue. No matter what the issue is, there is always a solution. Here are some common scenarios and some options of how to treat the windows.